You probably heard the term “nutrient-dense” before, but what does it actually mean? And how would one implement a nutrient-dense diet? Also, where does grass-fed beef fit into the equation? First, a definition: What is a nutrient? A nutrient is a substance in food that provides nourishment. Nutrients power your body from the cells on up. Macronutrients, which are the ones you’re probably familiar with already, like protein, fat, and carbohydrates. Micronutrients, which are those vitamins and minerals you’re told are important, but you may not be sure what exactly they do. A nutrient-dense food, then, is one high in — you guessed it — nutrients (vitamins, minerals, healthy fats, protein) but relatively low in calories. A nutrient-dense diet is one that includes as many nutrient-dense foods (and as few nutrient-light foods) as possible. Each of your nutrient-dense meals ideally contains food from the primary categories of nutrient-dense foods: a protein (like meat, seafood or eggs), a vegetable, a fruit, and, if you’re really dedicated, some nutrient-rich seeds, too. Below, we’ll dive into some of the most nutrient-dense foods, their unique benefits, and how to include them in your diet. Fun fact: One cup of sardines has four times the amount of vitamin D and twice the calcium as a glass of whole milk. Not only does vitamin D help build strong bones, but it can also help prevent various cancers, heart disease, weight gain, depression, and diabetes. Sardines also contain over 200% of your daily allowance for vitamin B12, 112% for selenium, and 73% of phosphorus. Plus, it contains an incredible 36.7 grams of protein. To get more sardines in your diet, toss them on your favorite salads. Drain them first, then stir together with extra virgin olive oil, lemon juice, mustard, garlic, salt, and pepper. We know what you’re thinking: Is grass-fed beef more nutrient dense than grain-fed beef? The answer is yes, absolutely. Grass-fed beef contains less fat, more CLA, more vitamins like vitamin E and more heart-healthy omega-3 fatty acids than grain-fed beef. CLA (conjugated linoleic acid) is an essential fatty acid and antioxidant. Best of all? It seems to be a miracle worker for lowering body fat. If you’re looking for a few recipes with grass-fed beef as the entrée, no worries. We may just be able to help you out there. Wild salmon are caught in the wild, not raised on farms (also known as aquacultures). Existing in their natural environment actually changes their nutrition profile. 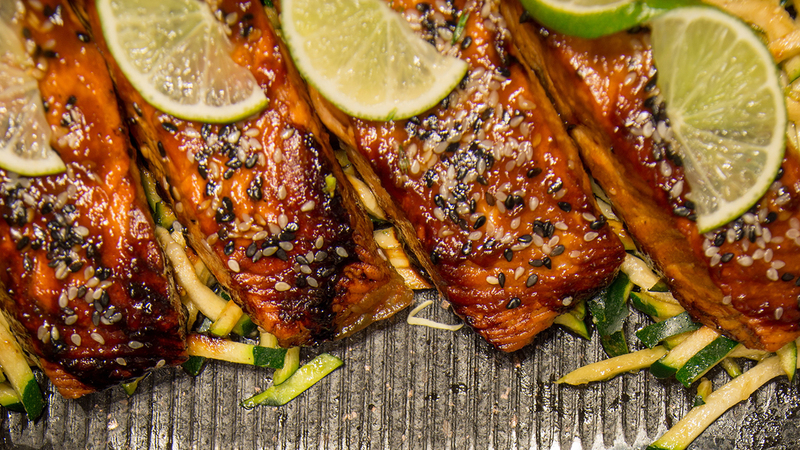 Salmon contains over 100% of your daily allowance of B12 and 85% of B6 vitamins. Plus, it’s rich in niacin, a fancy name for B3. All three give your body energy and help enzymes do their job. Fatty fish — like salmon — are an excellent source of healthy fats and protein (half a filet contains almost 40 grams). For perfectly-seared salmon, sear first in a hot cast iron skillet (skin down) then finish in the oven at 400 degrees for 10 minutes. While the jury is out on the taste (which we rule in favor of), there is no denying the nutrient density in beef liver. Beef liver contains over 1000% of your daily B12 allowance. A 100-gram portion also contains over 200% of your daily riboflavin (or B2 vitamins) and over 700% your daily needs for copper. Copper helps you form red blood cells and nerve cells, and has even been linked to preventing Alzheimer’s. If you’re not a fan of the flavor, here’s a simple solution: Hide it! In this meatloaf recipe, you combine liver with ground beef, vegetables, and spices, helping to mask the taste. Brussels sprouts are loaded with C and K vitamins. If you ever sliced your finger while chopping vegetables, you witnessed first-hand the importance of vitamin K — it’s what allows our blood to clot. It’s also an excellent source of folate (a B vitamin) and manganese, an essential mineral (meaning the body needs it to function properly). We love roasting brussels sprouts with garlic and balsamic vinegar. For added flavor, top with ButcherBox bacon or have with some of our Head Chef Yankel Polak’s candy bacon. One cup of broccoli has more vitamin C than an orange. Vitamin C helps rebuild connective tissues, reduce heart disease risk, boost the immune system, improve cholesterol levels, and aid the absorption of iron. Broccoli is also filled with antioxidants, fiber, and over 100% of your daily recommended vitamin K.
Broccoli tastes great simply roasted with olive oil, salt, and pepper. If you feel like getting creative, toss it in a stir-fry or “rice it” into one of your favorite dishes. Bok Choy (or Chinese cabbage) contains just 20 calories per cup, but it’s loaded with vitamins and minerals. With 144% of your daily needs for vitamin A, 74% for vitamin C, and 72% of your vitamin K, this is one vegetable you might want to consider grabbing next time you’re at the grocery store. If you’ve never cooked with bok choy, it tastes great in Asian-fusion dishes. Add it to a stir-fry or this Mongolian Beef recipe. Collard greens are often found featured on the menus of soul food and barbecue restaurants. When it comes to nutrition, collards are king. A single cooked cup contains over 1000% of your daily vitamin K, over 300% vitamin A, 58% vitamin C, 44% folate, and 44% manganese. Need we say more? You can braise collard greens with bacon for a healthy, incredibly satiating side dish. Or, leave the leaves raw and use them in place of a tortilla for a sandwich wrap. If you’ve ever wondered, “What’s with the hype?” when it comes to kale, here is your answer. Kale is a superfood in every meaning of the word, containing 206% of your daily needs for vitamin A, 134% for vitamin C, and 684% for vitamin K. It’s also a great source of copper and manganese — all at just 33 calories per cup. Up the nutrient level of your salads by swapping in kale for iceberg lettuce or romaine. We find it best to chop the kale pretty finely, as the stems can be difficult to chew. The nutrition level in a sweet potato is outstanding, particularly for a starch. One medium sweet potato contains over 400% of your daily vitamin A, and also contains choline, betaine, potassium, and manganese. They’re also high in fiber, slightly sweet, and incredibly versatile. Substitute sweet potatoes for other high-carb foods, like white potatoes. They taste great mashed, baked with a slab of grass-fed butter, or combined with sausage into a breakfast hash. Blueberries are a powerhouse for antioxidants. Actually, they are believed to contain more antioxidants than any other commonly-consumed fruit. Blueberries are also great for your immune system, containing high amounts of vitamin C, vitamin K, and manganese. Plus, they are relatively low in sugar (just 14.7 grams per cup) compared to high-carb fruits like apples or mangoes. The best way to consume berries? By the handful! Keep them on hand when you’re craving something sweet. Strawberries may be your secret weapon in helping to treat diseases. Like other berries, strawberries have high levels of antioxidants, helping to fight against chronic disease. Strawberries might also be linked to reducing your risk of cancer. If you still need convincing, strawberries contain high amounts of vitamin C, giving you a boost to fight the common cold. Strawberries are best consumed raw, as fruit juices contain high amounts of sugar. Add them to salads or wraps for a refreshing taste. Can fruits contain protein? Absolutely — protein is found in fruit and vegetables alike, not just in animal sources. One pomegranate contains 4.7 grams, or 9%, of your daily protein. It’s also loaded with vitamin C, K, and folate. Best of all, it’s packed with fiber — 45% of your daily allowance, in fact. If you’ve never peeled a pomegranate, it’s a pretty tricky process. However, pomegranate seeds are incredibly tasty, making a great addition to your favorite recipes — like this one for shredded beef. Originally from a plant in South America, chia might just be one of the healthiest foods you can find. A single ounce contains 4.4 grams of protein, 30% of your daily magnesium, and 18% of your daily calcium. Plus, while they contain 12 grams of carbohydrates, their high fiber content leaves these little seeds with just 1 gram of net carbs. Finally, they are a good source of healthy omega-3 fatty acids. Add chia to your morning smoothie or oatmeal for an extra fiber boost. Or, create your own chia pudding for a sweet, albeit healthy dessert. Flax seeds are becoming known for their wide array of health benefits. Just one tablespoon contains just 37 calories, but 1.3 grams of protein, 1.9 grams of fiber, and 3 grams of total fat. These seeds also contain B vitamins, calcium, iron, and magnesium. Finally, they contain a certain compound called lignans, which have been shown to reduce cancer risk. Actually, flax contains up to 800 times more lignans than other plant foods. Add flax seeds to your favorite recipes, like banana bread, oatmeal, and other baked dishes. You can also mix flax seeds with ground beef to make chili, meatloaf, and other recipes. One ounce of hemp hearts contains an incredible 9.2 grams of protein (more than peanut butter and other plant-based protein sources) but only 3.5 grams of carbs. They also contain a healthy dose of omega-3 and omega-6 fatty acids. They provide a good dose of amino acids, particularly arginine, which can help reduce the risk of heart disease. Hemp hearts make a great addition to salad dressings. Simply blend with olive oil, granulated garlic, and a little lemon juice for a delicious, creamy dressing which happens to be protein-packed.